This post has already been read 4724 times! Paul Twigg’s spring garden is a thing of beauty: Beautiful black dirt is powdery yet flat and even, awaiting his pointy hoe – perfectly straight rows carved at a uniform depth. While his neighbors look on – fat cows sloshing in the mud from the pasture across the fence, Twigg dribbles little handfuls of fertilizer, then, small handfuls of seeds, bending from the waist with long arms carrying precious bits into the rows beneath him. Kohlrabi, carrots, mesclun align near paper bag-tented huts protecting different varieties of tomatoes, peppers (“the black ones are ‘Dracula’ peppers,” he points out). Peas and garlic are well on their way. Paul Twigg is happiest, he says, in his garden. Digging in the dirt, smelling that yummy aroma of fresh soil, feeling the seedlings in his hands. This brings back memories of his childhood growing up in Pennsylvania, he says, in his grandpa’s garden. “Pap” he calls him. Where will it lead? Perhaps to a major discovery that will unlock the mystery of gene regulation that will produce the best plant for developing biofuel. In contrast to his gardening hoe and line stakes, Twigg’s research tools are more high-tech and microscopic. He utilizes Polymerase Chain Reaction (PCR) machines and next-generation sequencers to look at plants at the cellular and molecular level, analyzing plant DNA. His main research subjects are algae – specifically a single-celled algae called Chlamydomonas – and switchgrass. Both plants are popular subjects for research worldwide for potential biofuel sources. His love of plants comes from his DNA and propels his research, as a scholar and teacher, to discover clues that could solve a very important problem: How to use natural resources to sustain humans’ technology. Twigg, a molecular biologist in his 22nd year at UNK, doesn’t simply study plants or fuel per se, but instead, he examines questions at the cellular level through expression of genes that control specific traits in plant cells. Question one: how to alter or manipulate insect resistance. Question two: how to create different varieties of plants with different levels of cellulose and lignin. Lignin is a complex polymer in plant cell walls and plays an important role in the carbon cycle because it yields more energy when burned than cellulose. Lignin represents a loss of energy for ethanol production, Twigg said, so their projects attempt to find cultivars of switchgrass with lower levels of it. Question three relates to nitrogen deprivation. Basically, determining how, when you “stress out” plant cells, how and where they get nitrogen. Take a plant cell’s nitrogen away, and it begins to scavenge nitrogen away from someplace else in its cell, breaking down proteins and storing the resulting leftover carbons as fat. That fat is pretty much one step away from being diesel fuel, Twigg says. Complex work. And necessary, at the basic research stage, to inform further research to develop plants for use as fuel. 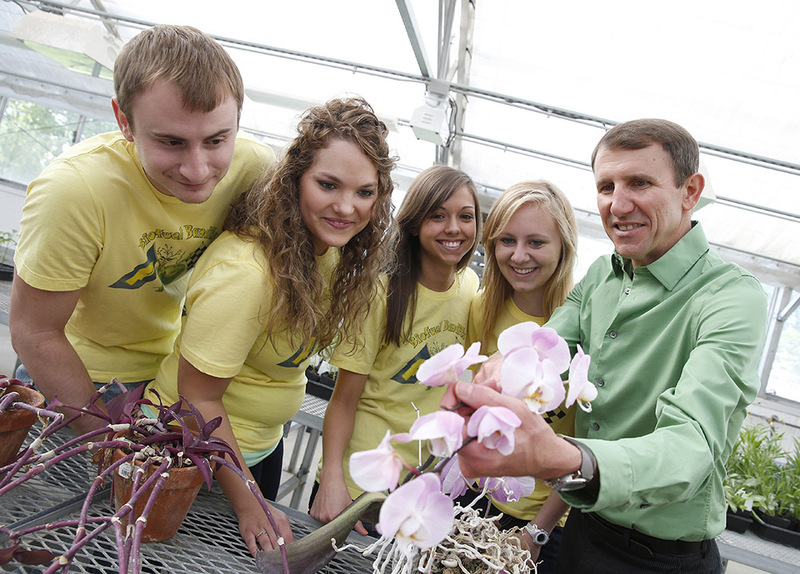 “In our research, we’re analyzing gene expression, that is, trying to isolate the genes necessary for that production of fats,” Twigg says, sitting in his greenhouse office near UNK’s Bruner Hall of Science. Real-time polymerase chain reaction is a lab technique that amplifies and simultaneously quantifies a targeted DNA molecule. The quantity can be either an absolute number of copies, or a relative amount when normalized to DNA input or additional normalizing genes. It’s a new approach compared to standard PCR, in which the product of the reaction is detected at the end of the process. Using a complicated and expensive real-time PCR machine, Twigg uses fluorescent dyes or DNA probes to quantify and detect messenger RNA (ribonucleic acid) and non-coding RNA in cells or tissues. (RNA differs from DNA in that it’s single-stranded and has a much shorter chain). 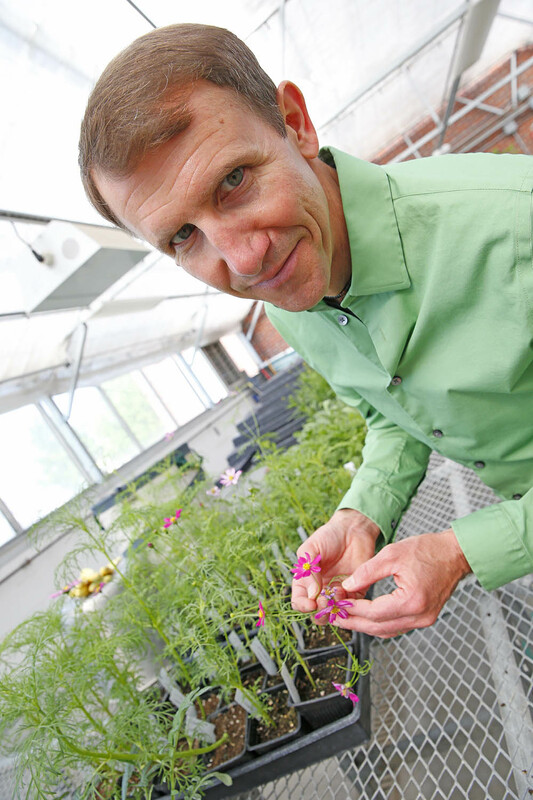 Much of Twigg’s research is funded by grants from the departments of Energy and Defense, and the National Science Foundation, through EPSCoR (the Experimental Program to Stimulate Competitive Research), and collaborative with researchers from the U.S. Department of Agriculture and at the University of Nebraska-Lincoln. His funded research over the past five years is nearly $5.5 million. Researchers on the teams work on different components and assign specific tasks to each researcher, compiling the data into research papers to be submitted to journals. 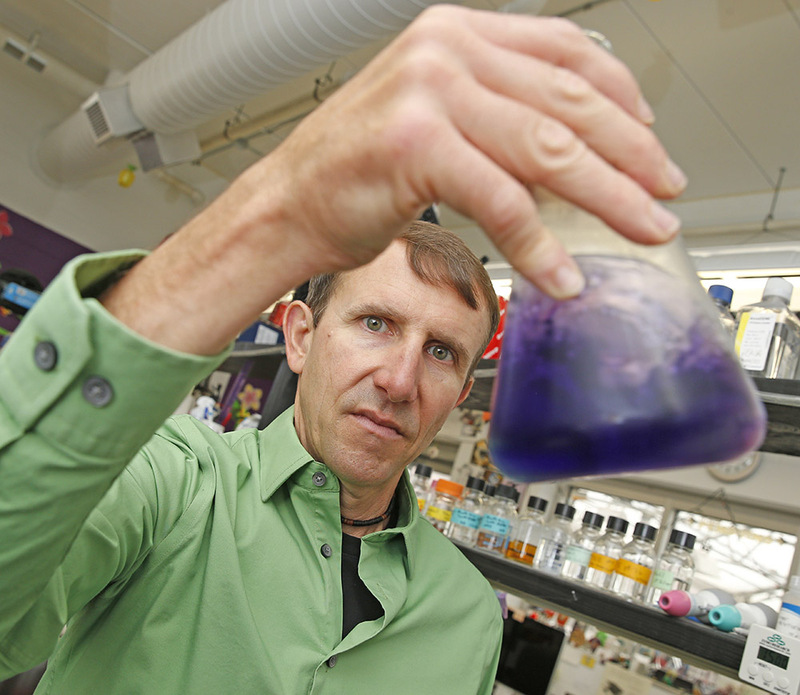 Twigg is a lead or co-author on dozens of papers that are informing biofuels research. Biofuels are fuels made from plant matter: grasses, inedible parts of plants and crop residues, as well as from crops like corn, sugarcane or wheat. Biodiesel is made from oil and grease: animal fat, recycled grease and vegetable oils. The history of biofuels goes back to the early days of the 1800s when things like alcohol, whale oil, camphene (a blend of ethyl alcohol, turpentine and camphor oil) were used as “burning fluids.” Plant-based fuels went by the wayside by the 20th century in favor of gasoline made from crude oil – but then rising prices for gasoline and environmental concerns again brought ethanol into popularity as a fuel for lighting, motor vehicle and household fuel. Following the 1970 Clean Air Act, two decades of biofuel research and development came to a peak in 2006, spurred by attention from President George W. Bush, who began his term with a push for cellulosic ethanol to join corn-based ethanol as a marketable alternative by 2012, followed by an order to reduce U.S. gasoline consumption by 20 percent by 2016. The Environmental Protection Agency had since eased those standards, although President Barack Obama has voiced renewed interest, unveiling in June proposed regulations to dramatically decrease carbon pollution. Climate change and other environmental and geopolitical concerns continue to prompt research into alternatives to petroleum-based fuels, while “food vs. fuel” debates have emerged to challenge popular alternatives like corn-based ethanol. Imagine someday driving a car or riding in an airplane fueled by grass or algae. Twigg says it’s already happening – and the potential exists for wider development and use of plant materials as fuel. That’s why his research is so important. Working on basic research that could lead to a marketable biofuel is something that Twigg came into either through what he calls “luck,” or having the right expertise at the right time, he said. If you take a tour of Twigg’s lab he easily gets animated and talks eagerly about his students: Murals, toy penguins, the plants in the greenhouse, a whiteboard with student names and phone numbers, charts and equipment — all prompt stories about his students. He is childless but his students are family, he says. He walked one down the aisle at her wedding. He’s happiest, he says, doing stuff with the students rather than working on his computer. “A good day for me for life in general… I’d be wandering around in the woods somewhere,” he says in his lab, laughing. “But a good day here would be having taught my class, feeling like the students got something out of it, maybe that my students were successful and excited about something happening in here. If there’s a favorite picture of me it would be with those people (he points to the whiteboard with students’ names). Their success is what I’m trying to do. Twigg’s co-researchers also note his devotion to his students as well as his standing in the research community – his “scientific cred,” particularly with his RNA work. “The things that Paul brings to any project is this kind of focus and being very methodical,” said USDA molecular biologist Gautam Sarath, who as an expert in perennial grasses has collaborated with Twigg on multiple research projects in switchgrass, buffalograss and partridge pea. “He tries it, and if something fails he curses and goes back and does it again. He doesn’t get easily dissuaded, because he understands what he has to deliver. Paul has become our defacto RNA guru and expert on gene expression. Twigg’s big discovery, he says, would be to find a “master switch” in a gene that could easily turn on or off the diesel or fat production in algae. Twigg’s hair is stuck to his sweaty brow and he chases a hose from the hands of his wife, fellow-biologist Janet Steele, eager to get water onto his raised beds where he just planted some carrots. Swallows dive-bomb him on their way to their nest under the deck on their home about 10 miles north of Kearney. Maybe that next big biofuels discovery. Bio-ethanol: This is the most common, made by fermenting sugars derived from corn, sugar cane, molasses, wheat, sugar beets; or from starches made from potatoes or fruit waste. Ethanol is made through enzyme digestion or fermentation of the sugars, distilling and drying. Ethanol can be used as a replacement for gasoline. It has a smaller energy density than gasoline, taking more volume to produce the same amount of work. Biodiesel: Produced from oils or fats – animal or vegetable – such as soy, mustard, flax, sunflower, palm, hemp or algae. Biodiesel can be used in any diesel engine where it may be safely mixed with mineral diesel. Biodiesel is biodegradable and nontoxic. Solid biofuels: Produced from materials like wood, sawdust, grass clippings, garbage, charcoal, dried manure, agricultural waste and nonfood energy crops. Also referred to as second-generation or advanced biofuels, switchgrass is one of the many materials considered to have market potential as a sustainable biofuel source. Dried and baled switchgrass is used in European countries such as the Netherlands and Germany as a cofuel with coal in power plants. Cellulosic ethanol: Produced from cellulose-containing organic matter, this term signals a switch from food-based materials and feedstock to grass and waste residue. Algae and other biofuels: Research continues on the commercial potential of oil-rich algae, which can be grown and harvested from ponds. Still others are researching potential for other materials including fungi, and bacteria from sources such as animal waste. Education: Bachelor of Science in biology, Indiana University of Pennsylvania, 1987; Ph.D. in botany, The University of Tennessee-Knoxville, 1993. Career: Teaching assistant, The University of Tennessee-Knoxville, 1987-89; Research assistant, The University of Tennessee-Knoxville, 1989-92; University of Nebraska at Kearney, 1992-present. Family: Wife, Janet Steele, UNK professor of biology. Hobbies/Interests: Gardening and plants, avid runner, cycling, Pittsburgh Penguins hockey, motorcycle riding, owner of six cats and a bunny, can memorize music first time he hears it. Honors/Awards: 2014 Pratt-Heins Award, UNK Mentoring of Student Research Award, 2006; Two-time winner of UNK Faculty Mentoring of Graduate Student Research Award. Areas of research/specialization: Molecular biology of nitrogen-fixing plants (plants that can use bacteria to absorb nitrogen from the air in a usable form), biofuel plants and algae, plant-insect interactions, and plant-virus interactions. Courses taught: Cell Biology, General Biology, Biology 105/106, Plant Physiology, Mycology Regional Field Study, Molecular Biotechnology, Forensic Biology, Plant Systematics, Plant Pathology, Inside Your Genome, Dangerous Plants, Cancer Biology, And Biology 420 (Senior Research). Wow . It’s a great project. Your garden is so nice. Keep it up . Thanks for sharing.